Road work is progressing across Cherry Hill as part of the 2016 Road Maintenance Program, with construction set to begin Wednesday, Oct. 12, on Munn Lane, between Brace Road and Kay Drive, and Cotswold Lane, from Kay Drive to the bridge past Folkstone Way. Scheduled improvements include a complete mill and overlay of the road surface, as well as isolated concrete repairs where tripping hazards exist. Removal of driveway aprons and curbs may be necessary due to grade changes and/or deterioration. Notification by door hanger will be provided by the contractor when the actual work will take place. School bus schedules and trash pick-up will remain undisturbed, but parking privileges may be altered when work is scheduled for your area. The contractor will notify you if vehicle parking at your property will be affected. 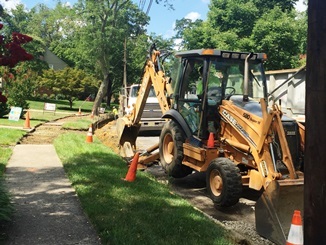 This year's Road Maintenance Program calls for the reconstruction of parts of 56 local roads, and is a significant investment meant to preserve our quality of life, support public safety, and ensure our neighborhoods remain robust, vibrant places to live. If you have questions or concerns about the Road Maintenance Program, contact the Department of Engineering at (856) 424-3203.